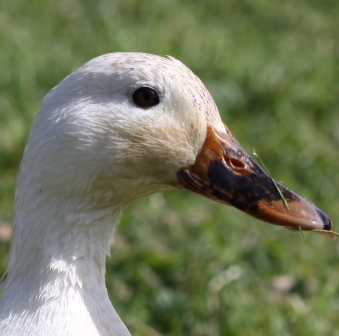 We have our very own slug control system… wild ducks. When we moved here 10 years ago a female duck was our first visitor. She tapped on our back door requesting breakfast. We fed her kitchen scraps and we soon knew that she was pleased with the warm welcome she received from us because she returned every day. In early spring Speckles brought her mate, a handsome mallard we named Gerald. 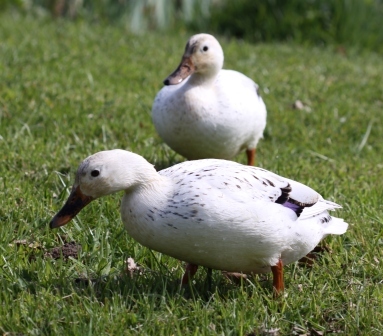 In April Speckles brought 10 newly hatched ducklings to us. They needed tiny morsels of food so we bought a sack of corn and fed them twice daily. She proudly led her ducklings around the neighbourhood stopping at all the friendly places she’d established over the long winter. They had breakfast with us, a mid morning snack, lunch and afternoon tea elsewhere then back to us again for supper. Despite the local duck hunt each year some of her offspring still visit us daily. They nest in our garden and take a dip in our pond. And best of all they rummage through the borders to find tasty morsels. You just can’t beat a nice juicy slug. Did you know that 2012 was officially the second wettest year in the UK since records began. Wet conditions are perfect for slugs and snails and most gardens suffered from the boom in their populations. They love juicy young plants in particular and are always attracted to any wilted foliage of new seedlings. Let new plants develop 4 or 5 good strong vigorous leaves before you plant them out and make sure they are watered in well. Scatter a few wilted leaves around plants as decoys to attract the slugs first. Surround prized plants with dry sharp or gritty material such as wood ash. Encourage birds into your garden with food and water. Thrushes in particular love snails.